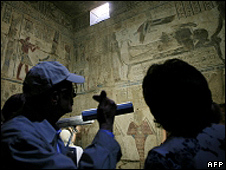 The Louvre museum in Paris will return five ancient fresco fragments to Egypt within weeks, France's government says. The announcement comes two days after the head of antiquities in Cairo said he would cease all co-operation with the museum until they were sent back. The Egyptians say the Louvre bought the Pharaonic steles in 2000 even though it knew they had been stolen in the 1980s. They are believed to be from a 3,200-year-old tomb of the cleric, Tetaki, in the Valley of the Kings, near Luxor. The steles, which are each only 15cm (5.9in) wide and 30cm (11.8in) high, are currently part of the Louvre's reserve collection. The decision to return the disputed fragments came after the French Culture Minister, Frederic Mitterrand, convened a special meeting of a national committee empowered to rule on restitution. The committee's experts were said to have been satisfied with the evidence presented by the Egyptian authorities showing they had been stolen. "Restitution is now a matter of weeks away," the culture ministry told the AFP news agency after the meeting, adding that the committee had voted unanimously to return the artefacts. The ministry also said the steles had been "acquired in good faith" by the Louvre. Four were purchased from the Maspero gallery in France in 2000, while the fifth was acquired at auction in Paris in 2003. Ancient Egyptian artworks and relics are displayed in many of the world's top museums, but in recent years the Egyptian government has stepped up pressure to repatriate some of them.